With an abundance of self catering holiday rentals in France Holiday Villa Rentals offer a luxurious and spacious alternative to cramped hotels and make the ideal accommodation to explore the rich diversity of the various regions with all the comforts of home. We highly recommend booking a private holiday home or villa rentals in France. Booking a self catering holiday rental home in France allows you to enjoy a much wider range of accommodation in some of the most beautiful rural and interesting residential locations all over France. 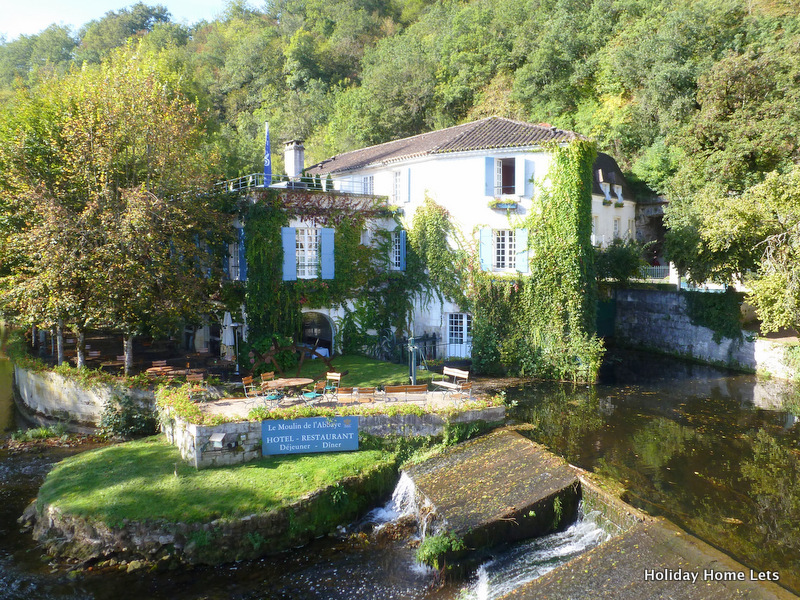 Our mini guide to France begins in the Dordogne where we have booked a Holiday Rental Gite in Brantome to explore one of the most beautiful and historic regions in France. 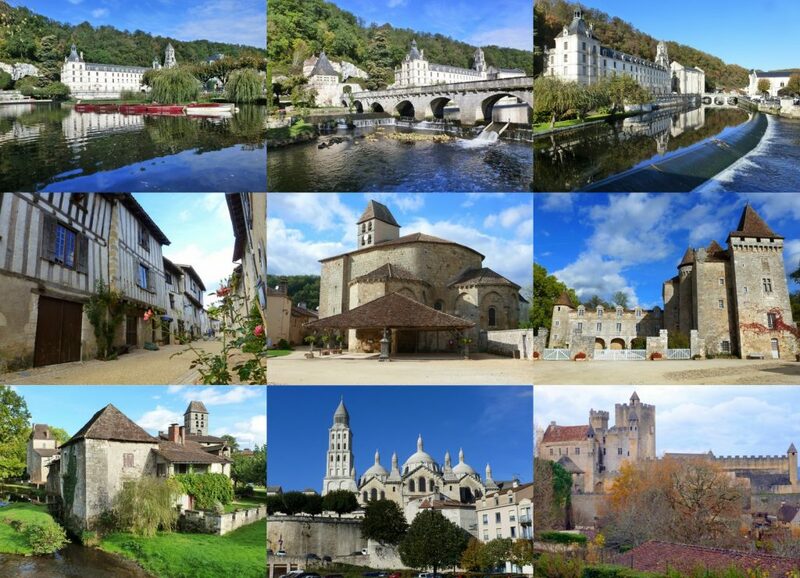 Brantome, St Jean de Cole, Perigueux, the Dordogne. What to do in the Dordogne, Perigord and Aquitaine. What better way to enjoy France than book a holiday rental gite in The Dordogne, or a holiday rental in Brantome the Venice of Perigord, whilst there you can visit the Benedictine Abbey, the troglodyte caves, the Friday markets, enjoy the river walks, boat trips, canoeing and waterside restaurants beside the mill stream and river Dronne and generally enjoying the mild weather in Brantome. Although there are many hotels in Brantome why not try a vacation rental gite and enjoy the real France in a 250 year old Maison Paysanne and holiday rental gite in Brantome. Other places to visit nearby are: Bourdeilles, St Jean de Cole, Thiviers, Excideuil, Bergerac, Angouleme, Perigueux, Le Bugue, Riberac, La Mareuil and the Royal Oak British Pub. Brantôme is one of the most beautiful places in the Dordogne, but whilst you are there it is well worth making the effort to visit other places nearby. Some of these there are classified officially as ‘les plus beaux villages de France’, the prettiest villages in France. The closest are Bourdeilles and St-Jean-de-Cole. A lovely village, 7km from Brantome, it is situated on the river Dronne and boasts a chateau, a moulin (mill), a medieval centre and many panoramic views. In the village there is the 15th century Maison de Seneschal with its lovely steep pointed roofs, also the Moulin Seigneurial which was fortified in the 12th century. Bourdeilles’ church dates back to the 12th century and on one side there is a lovely walk leading up to it with a cobbled path flanked by lawns and simple gardens and attractive stone, medieval houses. Wandering around the village there are lots of beautiful spots. Down by the river there is an attractive stone bridge which was originally built in the 14th century but rebuilt in the 18th century following severe floods. Every Sunday morning is market day at the Place de la Halle. The chateau de Bourdeilles is a renowned historical monument. This former seat of a barony will delight history and art lovers. The chateau consists of two castles, built on a rocky terrace overlooking the Dronne, from different periods, one medieval, the other renaissance. The renaissance chateau is richly decorated and includes the “Salon Doré – the golden room, and a furniture collection of the 15th to 19th century. Inside the castle walls there is a garden area laid out in traditional formal French style – avenues of trees, clipped box hedges and neatly laid out grassy areas. Visiting the chateau and the small town around it makes for an excellent day trip. The small but very picturesque village of St Jean de Cole is 22km from Brantome and is well worth a visit. It dates from the 11th century and was first settled by monks. It is a charming village with ochre coloured houses, including many half-timbered houses, and lovely tiled roofs which once won the ‘finest roofs in France’ competition. The village square is dominated by the 12th century Château de la Marthonie, which was reconstructed in the 15th century after being ravaged in the 100 Years War. There is a superb Roman-Byzantine church, built in the 11th century. There are restaurants, a hotel, and other shops. You can partake of a delicious lunch in one of the many quaint cafes and restaurants in the square. Every year in May and for the past 20 years, there is a floriale, a floral week-end which attracts many visitors from all over the world. There are works of art, crafts, local products, new floral varieties, rare plants, garden decorations, a …craft gallery, silk trade, painting and potter’s workshops, and exhibitions. St Jean de Cole is situated on the meandering river Cole, a tributary of the Dronne. Its banks are still edged with trees and are home home to a variety of wild life; herons, crayfish, ducks and moor-hens, and fish of all kinds. Spanning the river is a fifteenth century Romanesque hump-backed bridge beside a watermill. In the village itself the rue du Fond du Bourg has half-timbered houses reconstructed in the 14th century. The largest underground network in the Périgord, of which only 13 km have been explored to date. Seepage through the limestone rock has created one of the most beautiful natural settings with impressive calcite, stalactites, and stalagmites. Various chambers have also been hollowed out and at one of these there is a sound and light show where groups of stalactites and stalagmites are illuminated rendering them even more impressive. Prehistoric paintings dating back 17000 years have also been discovered. They are the authentic witness of the art of our ancestors (made long ago). They depict bison and horses covered with a thin layer of calcite that gives them a beautiful blue glaze. As well as the caves there is a small cafe, a picnic area, a shop and a play area on the site. There is also a video explaining the formation of the caves. The visit to the caves is by guided tour only with an English commentary. Each tour takes about 45minutes. Grotte de Villars is 14km from Brantome. Perigueux, 20km from Brantome, is the capital of the Dordogne department and is situated on the Isle river, a tributary of the Dordogne. It has been in existence since neolithic times, and later became an important Roman centre. The town suffered a great deal in the Middle Ages through the Hundred Years War and then had a ‘rebirth’ and much construction dates from the 16th century. Perigueux continued to be an important centre for the region from the 18th century onwards, Each of these periods has left its mark on the town. From Roman times, there is the Vesone Tower and the remains of an amphitheatre, whilst the Chateau Barrière dates from the early middle ages. Perigueux also contains an interesting medieval and renaissance centre, with attractive boulevards and streets lined with medieval houses to explore – these are concentrated in the region around the Byzantine style Cathedral Saint Front, which also retains its attractive arched cloisters. Its cluster of domes can be seen all around the city. It is a UNESCO World Heritage Site and has a Greek cross ground plan based on St Mark’s cathedral in Venice. It is also the model for the Sacré Coeur church on the top of the hill at Montmartre in Paris. Saint-Etienne church (once a cathedral) dates largely from the 16th century when it was reconstructed, although parts of the earlier church on the same site can still be seen. The main sights of Perigueux can be seen on an easy walk around the city centre. One of many attractive spots in Perigueux to sit outside and enjoy a coffee or stop for lunch is the Place de Navarre with its 16th century buildings. Nearby on the Rue Aubergerie is the 15th century fortified Abzac de Ladouze residence and also on the street the Sallegourde building – both homes to wealthy merchants in the 15th century. There is a daily market for fresh fruit and vegetables on Place du Coderec with its 19th century covered market. Also on the square is the Maison Lapeyre with an overhanging turret and a charming half-timbered house. Rue Limogeanne is probably the highlight of Perigueux, a lovely street full of interesting buildings with inner courtyards, ornate carvings around windows or doors and full of atmosphere. Although not in the Perigord region, it’s also worth visiting Angoulême in the Charente to see its charming old town, and then beyond it to Cognac, where it is possible to visit some of the brandy producers there. Angoulême is encircled by boulevards above the old city walls, known as the Remparts, from which fine views may be obtained in all directions. Within the town the streets are often narrow and the “old town” has been preserved, maintained and largely reserved for pedestrians. It has a cobbled restaurant quarter, with several galleries and boutiques. St Peter’s Cathedral dating from the 11th and 12th centuries is in the Romanesque style and has undergone frequent restoration. The hôtel de ville, is a handsome 19th-century structure and incorporates two towers of the château of the Counts of Angoulême. It contains museums of paintings and archaeology. The Circuit des Remparts motor racing event in Angoulême, with its street circuit around the ramparts is held the Sunday of the mid weekend in September. It is also the world’s largest gathering of pre-war Bugatti race cars usually around 30 cars. British vintage and classic cars are also on show all over the town, most having been driven to the event. 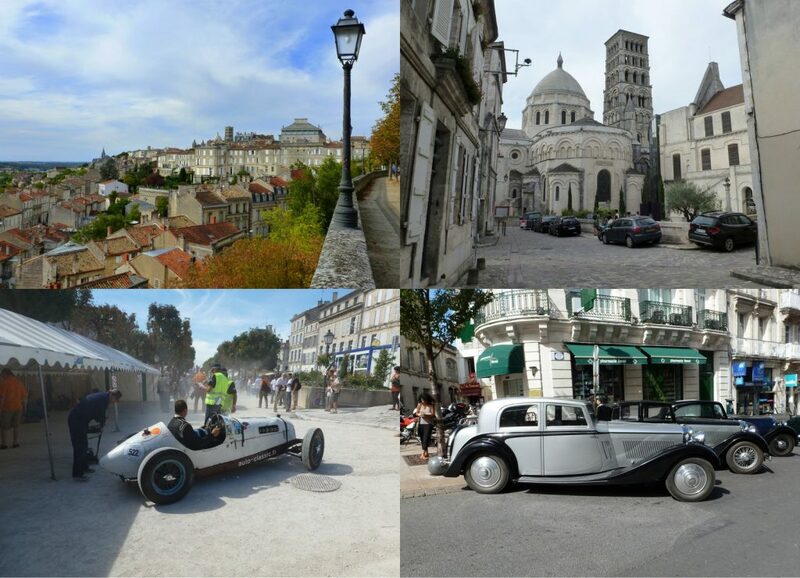 The Saturday of the “Remparts” weekend includes a tourist rally (as opposed to a speed event) for classic and sporting cars, around the Cognac area. Perigord’s gastronomy enjoys a great reputation. The two great stars of Périgord cuisine are foie gras and truffles (truffes), There are also walnuts and chestnuts, wild mushrooms, the little flat discs of goat’s cheese called cabécou and the sweet light bread called fougasse. Wine from Monbazillac and Bergerac is excellent. Duck is used both for foie gras and for confits de canard. The duck is cooked and preserved in its own fat as confits which can either be eaten on its own or used in the preparation of other dishes such as cassoulet, another regional favourite. Magret de canard, or duck breast fillet, is one of the favourite ways of eating duck and appears on practically every restaurant menu. 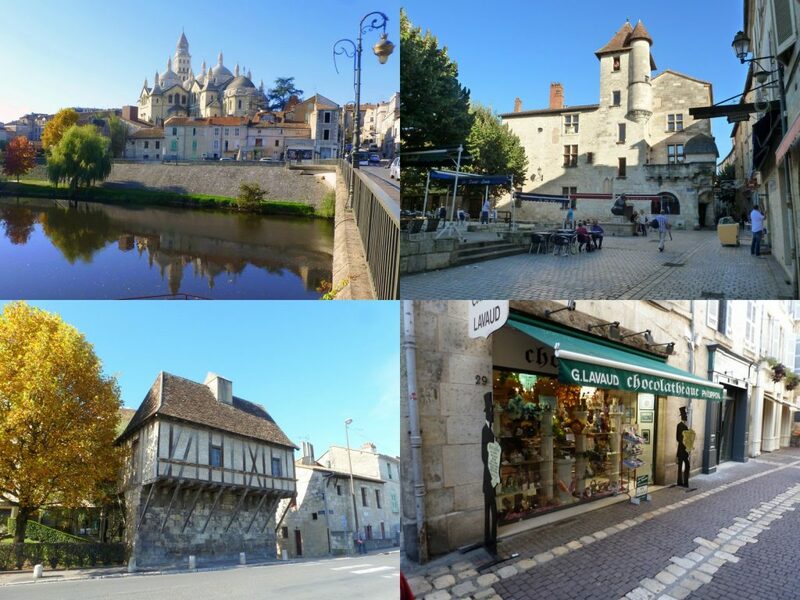 Perigueux is just 25 minutes away and worth visiting too, especially if you want to do a big shop at the large supermarket complex Auchan, just 5 minutes away from the town. To experience the real France we feel you must come and stay and enjoy some of the holiday homes, villas and gites in Dordogne.